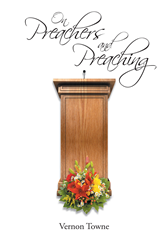 Recent release “On Preachers and Preaching” from Page Publishing author Vernon Towne is a thorough survey of the life lessons learned through one man’s career as a devoted pastor who was constantly striving to bring the most to his preaching style. Vernon Towne, a Presbyterian minister whose fifty years of experience has brought him around the world and back to the United States, has completed his new book “On Preachers and Preaching”: a collection of lessons developed during his time as a chaplain in South Vietnam, in his time Stateside, and in his role as a husband and a father. Published by New York City-based Page Publishing, Vernon Towne’s essays and arguments are never critical of other styles, but encourages what he calls ‘extemporaneous’ preaching; that is, referring the gospel to parishioners in natural, rather than prepared statements. Those with an interest in the ministry, or those wishing to reinvigorate their parish, can purchase “On Preachers and Preaching” at bookstores everywhere, or online at the Apple iTunes store, Amazon, Google Play or Barnes and Noble.